102 pages (Spiralbound), published by Magic, Inc. 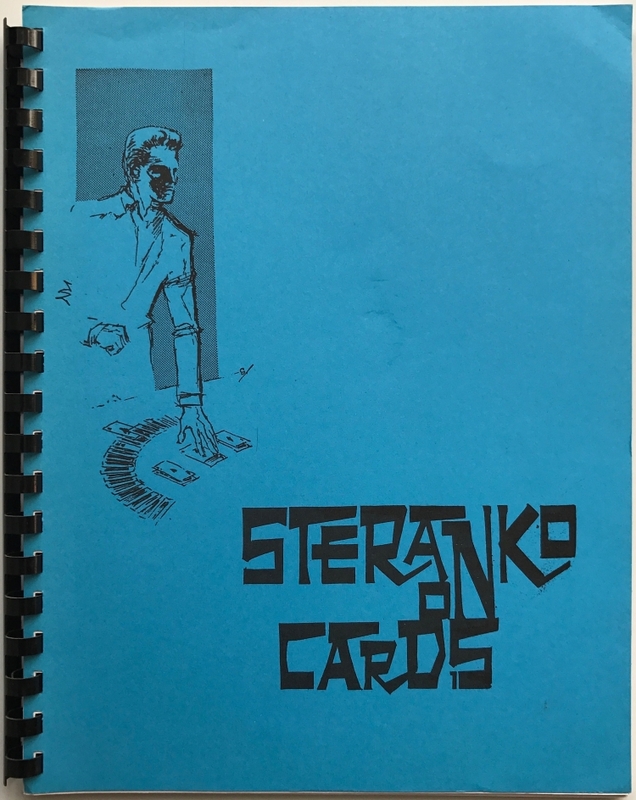 Illustrated with drawings by James Steranko. chapter seven - cues on cards\n"a few little touches that will aid in gaining a finer card technique" - cue on cards (what cards to use?) - on routines - on confidence - on skill - capsule cues\njames steranko 1960 James Steranko Chapter Seven - Cues on Cards "a few little touches that will aid in gaining a finer card technique"
voodoo card\n"an experiment into the unknown" card named and removed and turned over, mate turns over in deck, they transpose, triumph phase\njames steranko\nthe voodoo card\nguy hollingworth\njames steranko 1960 James Steranko Voodoo Card "An Experiment into the Unknown"
dead man's hand finale\nchapter twelve, "a lesson in card artistry" spectator choses card, they turn out to be dead man's hand (pair of eights and aces), third ace appears between them\njames steranko 1960 James Steranko Dead Man's Hand Finale Chapter Twelve, "A Lesson in Card Artistry"